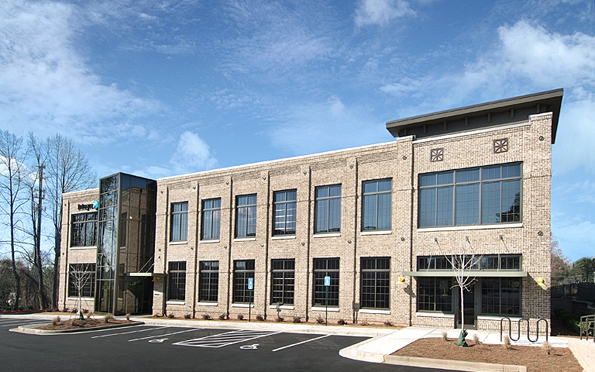 RJTR designed Integra Construction’s new headquarters building in Sandy Springs, Ga. The building is two-stories with approx.. 15,600 GSF. Befitting their image as a builder with high-quality construction standards, a brick veneer exterior was chosen for its design flexibility that effectively demonstrates Integra’s craftsmanship while remaining cost effective. The use of brick enabled the designers to give the overall building an aged, early-American, industrial, Main Street aesthetic that easily blends with the clean details of the open stairs which interrupt the facade to create a distinct entry. Integra occupies the entire top floor with executive offices, staff workspaces, accounting and estimating departments, and a hospitality/ entertaining bar. On the first floor, there is a lobby, a large conference room, a break room, and storage areas. Integra’s office areas on both floors are linked by a glass-enclosed, open stair that is a distinctive exterior feature as well as in the two-story lobby space. 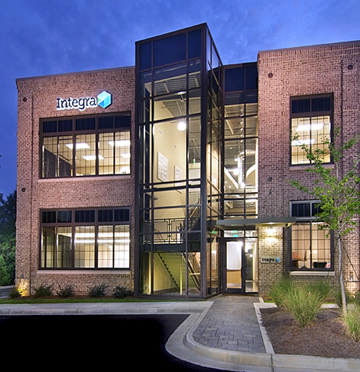 Integra’s headquarters has a LEED Silver Certification. LEED points were secured for high-efficiency HVAC systems, use of recycled content and regional materials and day lighting.